Astonishing footage has emerged of Beyonce's baby sister Solange Knowles viciously assaulting Jay Z in an elevator. Jay Z was seen on CCTV avoiding punches and kicks as Solange teed off on him. The trio were attending the Met Gala and afterwards they all got into the elevator at the Standard Hotel in New York City. It was clear from the beginning of the footage, which was captured by a security camera, that Solange had an issue with Jay Z. 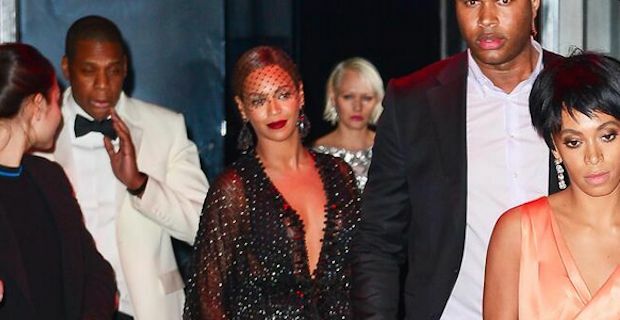 The footage shows that once the elevator doors shut Solange confronted Jay Z by getting right in his face before swinging at him a few times. A bodyguard, who was also luckily in the elevator, then restrained Solange and held her away from Jay Z but she still lashed out with 3 kicks from the other side of the elevator. The security footage was video only so there is no audio available to shed some light on what Jay Z might have done to upset Solange so much. Speculation is rife on the web as to what happened but we are placing our money on it being a publicity stunt in the build up to Solange's latest album which is due out in the Autumn. Beyonce, who recently performed with Solange on stage at Coachella, left with her sister after the kerfuffle. That would suggest that she is in her sisters camp on whatever has taken place as Jay Z left a little afterwards in a separate car.